In the spring of 1914, Georges Clemenceau – journalist, republican, once and future prime minster of France – paid a visit to his close friend Claude Monet. The artist had been depressed since the death of his beloved wife, Alice, three years earlier; his bleak mood was compounded by the realization he was losing his sight and the sudden death, at age 46, of his eldest son, Jean. Along with other members of Monet’s inner circle (which included the dramatist and actor Sacha Guitry; the writer and art critic Octave Mirbeau; and Monet’s first biographer, Gustave Geffroy), Clemenceau began encouraging the painter to get back to work, fearing nothing else would bring Monet out of his despair. These efforts by Clemenceau (a man known for his powers of persuasion) sparked what would become an obsession on the part of the Impressionist master spanning more than a decade. Canadian art historian and two-time Governor General’s Literary Award winner Ross King turns his finely honed gaze to the project that would – despite frequent bouts of self-doubt, destructive flares of temper, near blindness, and the disruptions of the First World War – become Monet’s greatest accomplishment: his Grande Décoration, a series of huge canvases depicting his beloved water lilies. King gives a cursory overview of Monet’s life prior to the period between 1914 and the artist’s death in 1926, noting that, despite his stereotypical “artistic temperament,” Monet was incredibly successful, earning a substantial amount of money from his work, which allowed him to purchase property in Giverny, where he cultivated the famous garden from which he drew so much inspiration. We’re also provided with much historical context and just enough art history to render Monet’s story accessible to those with little familiarity with the master beyond recognizing some of his better-known paintings. 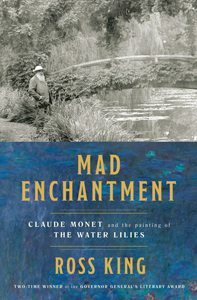 More importantly, King provides a sense of the man himself, using quotations from Monet’s letters and the historical record to create a portrait of a beloved man who nevertheless often acted like a needy, petulant child, begging favours from Clemenceau and other well-connected friends, especially during the war. Despite this (as King tells it), Monet’s talent and largesse made up for the times he was in a foul mood, and there is no denying the painter’s artistic genius or passion. The friendship between the two men was remarkable, and forms the backbone for King’s narrative, but the author’s focus on the French statesman often detracts from the reader’s experience of getting a handle on Monet.